I wanted to give my friends a little gift for Thanksgiving, showing them that I value our friendship and that I’m thankful to have them in my life. 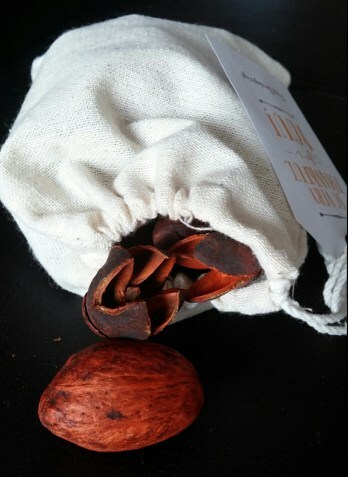 I came up with these cute little potpourri bags (free printable tags found here). 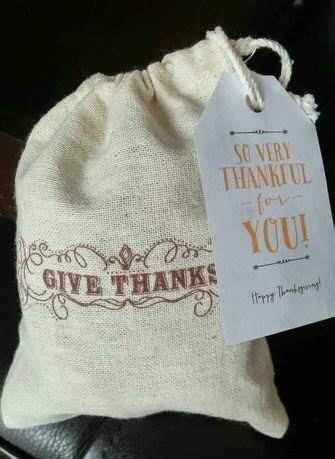 When shopping at Michael’s one day, I saw the linen bags that say “Give Thanks” on them. I bought 2 packs of 3, knowing I’d find a way to use them, whether it was to wrap a small gift or to hold silverware at a place setting. I put them in a bin and forgot about them for a little bit. Cut to a few weeks earlier when I went on a quest with one of my friends to find some pumpkin scented potpourri. I found it on a late night run to Walmart. It’s the Better Homes & gardens brand, Spiced Pumpkin Pie Scent. I put it out in a couple places of the house, and it smells like fall every time I walk in those rooms. The day before Thanksgiving, I decided to put the bags and the potpourri together and make little scented satchels for my friends. I figured they could use the gift as it was, by putting it in a bedroom or bathroom, or, they could out the potpourri into a small bowl. The day after I gave these out, one of my friends texted me telling me how much she loved the gift and that I had inspired her to make these for some ladies on her husband’s side of the family. I couldn’t have been happier to hear it! If you can’t find holiday-specific linen bags, try to find blank bags, get a festive rubber stamp and some ink, and stamp your own bags. I promise it’s easy, and you’ll feel extra crafty.